In China, lung cancer is a malignant tumor of the highest morbidity and mortality. About 80% of lung cancer patients are non-small cell lung cancer (NSCLC) patients. For NSCLC patients, most have been in the late stage of lung cancer in clinical diagnosis, which lost the opportunity for surgical treatment. The main treatment is chemotherapy, but taking the traditional chemotherapy can lead the therapy to the platform stage [1,2]. The rise of targeted therapy has brought new hope to the treatment of lung cancer. Studies have shown that epidermal growth factor receptor (EGFR) is closely linked to cell signal transduction, tumor angiogenesis, metastasis, invasion, and other activities [3,4]. Epidermal growth factor receptor tyrosine kinase inhibitors (EGFR-TKIs) drugs are a new class of anti-tumor drugs in recent years. It is used for advanced non-small cell lung cancer because of its good efficiency and high tolerance [5-7]. However, the effect of EGFR receptor gene mutations on the efficacy of EKIs drug therapy is less reported. This study explores the effects of epidermal growth factor receptor gene mutations on bevacizumab combined with erlotinib in the treatment of patients with non-small cell lung cancer. Ninety-five patients with non-small cell lung cancer were enrolled in this study from June 2012 to June 2013, with 51 male patients and 44 female patients. Real-time fluorescence PCR and polymerase chain reaction (PCR) were used for analyzing EGFR gene mutations. There were 36 cases of EGFR mutation and 59 cases of wild type. The patients were divided into two groups: mutant group (n=36) and non-mutant group (n=59). There were no significant differences in the clinical data between the two groups of patients (P>0.05) (Table 1). Table 1: Comparison of clinical data between the two groups of patients. Inclusion criteria: (1) diagnosed as non-small cell lung cancer by pathology; (2) patients with stage IIIb~IV disease; (3) EGFR mutation exon positive in the mutant group; (4) more than 3 months of the expected survival period; (5) patient age ≥ 20; (6) Eastern Tumor Collaboration Group (ECOG) functional status score of 0 to 2 points, and patients with measurable lesions; (7) patients voluntarily accept the treatment program, and signed informed consent. Exclusion criteria: (1) combined with severe diabetes, hypertension, and other medical diseases; (2) with liver and kidney failure; (3) expected to survive less than 3 months. Oral administration of erlotinib (Shanghai Roche Pharmaceutical Co., Ltd., J20120060, specifications: 150 mg/ tablets) was carried out 1 h before meals or 2 h after meals, with one pill per time per day. Bevacizumab was combined (Roche Biopharmaceutical Company, United States, BS20067454, specifications: 100 mg/4 ml), 15 mg/kg by intravenous infusion for 21 d as a cycle. Medication was stopped with tumor progression, toxicity not able to tolerate, or the patient cannot continue to take the medicine due to economic reasons. The patient's clinical data were collected 1 week before the start of the drug treatment, including liver and kidney function, blood routine and imaging, as the baseline status. The clinical efficacy of treatment was evaluated by reference to the Response evaluation criteria in solid tumors (RECIST). Complete remission (CR): all target lesions disappeared after treatment. Partial remission (PR): At least 30% reduction in the sum of the longest diameter of the target lesion after treatment compared with the baseline. Stable disease (SD): Compared with the baseline value, the sum of the longest diameter after treatment between PR and PD. Progression disease (PD): Compared with the baseline value, the longest diameter of the lesion increased by 20%, or at least one new lesion appeared. The total effective rate (RR) for disease treatment is the percentage of CR+PR. (1) Comparison of short-term efficacy between the two groups of patients after treatment. (2) Routine test of blood routine, liver, and kidney function, according to the WTO adverse reaction criteria for the evaluation of adverse drug reactions in patients. (3) Follow-up analysis of the patients, the follow-up time ended at October 31, 2016. Survival time (OS) was compared between the two groups, OS for the first time from the patient began administration to the death of the patient. SPSS 22.0 software was used for statistical analysis. The t-test was used to compare the measurement data. Count data were compared using χ2 test. The Kaplan-Meier survival curve was used for survival. The survival curves of the two groups were compared by Log-rank test. P<0.05 for the difference was statistically significant. The total effective rate of the mutant group was 77.78%. The total effective rate of non-mutant group was 44.07%. The difference between the two groups was statistically significant (P<0.05) (Table 2). The incidence of rash and the incidence of diarrhea in the mutant group were significantly lower than those in the non-mutated group were (P<0.05) (Table 3). Table 3: Comparison of toxic and side effects between the two groups (n (%)). 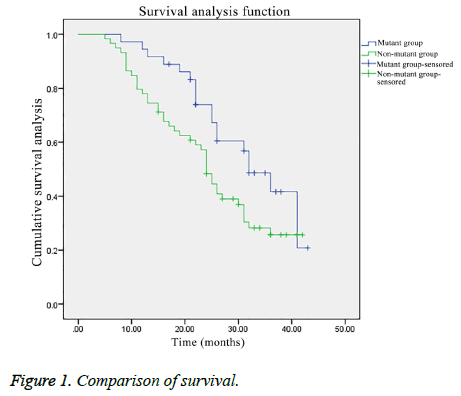 The overall survival of the patients in the mutant group was significantly better than that in the non-mutant group (χ2=4.026, P<0.05) (Figure 1). Figure 1: Comparison of survival. As a common clinical malignancy, 70 to 80% of non-small cell lung cancer patients has been in the late stage of the tumor in the clinical diagnosis, which lost the opportunity for surgical treatment. It has brought a huge threat to human health and life safety . At present for the treatment of lung cancer, its clinical effect is still poor. Especially for patients with advanced lung cancer, its survival is shorter. Therefore, the search for effective treatment is still the focus of clinical research [9,10]. EGFR gene research for molecular targeted therapy against non-small cell lung cancer has a very important clinical significance. EGFR gene consists of 28 exons, located in chromosome 7 short arm 7p12-14 area . Data analysis based on EGFR gene mutations showed that only 89% of the mutations were focused on the L858R site mutation at exon 21 and exon 19 absent, Although the entire tyrosine kinase coding region can mutate . This study aimed at the detection of the most common exon 21 mutation in EGFR and exon 19 mutation. In 95 patients with non-small cell lung cancer, 36 patients with EGFR mutations were detected. At present, it has made great progress for non-small cell lung cancer patients with targeted therapy. With the use of small molecule tyrosine kinase inhibitors, targeted therapy has entered a new stage . Small molecule tyrosine kinase inhibitors (TKI) are directed against epidermal growth factor receptors and thus play a pharmacodynamic role [14,15]. Erlotinib is a recombinant humanized monoclonal antibody that plays an anti-tumor effect primarily by inhibiting the production of tumor blood vessels. Erlotinib is also the first approved TKI drug in US . Erlotinib can bind to human vascular endothelial growth factor (VEGF), thereby blocking the biological activity of VEGF, thereby inhibiting tumor angiogenesis . Since the inception of erlotinib, it has been used for lung cancer, breast cancer and colorectal cancer in the clinical treatment. This study was to investigate the effect of EGFR gene mutation on bevacizumab combined with erlotinib in the treatment of non-small cell lung cancer. 95 patients were divided into mutant group with 36 cases and non-mutant group with 59 cases according to EGFR gene mutation. Both groups received bevacizumab combined with erlotinib. The results showed that the short-term efficacy of the mutant group was significantly better than that of the non-mutant group. In addition, the incidence of side effects was significantly lower in the mutant group than in the non-mutant group. Indicating that bevacizumab combined with erlotinib treatment of non-small cell lung cancer, with better efficacy and better tolerance in EGFR gene mutation patients. This is like the clinical reports. Some studies have shown that , for patients with advanced lung cancer, remission rate in mutant patients with paclitaxel combined with carboplatin chemotherapy was higher than that in wild type patients. In addition, some scholars have suggested that mutant patients with combined radiotherapy and chemotherapy are more effective than wild type . In addition, the overall survival time of the two groups was analyzed. The overall survival of the patients in the mutant group was significantly better than that in the non-mutant group (P<0.05). Indicating that bevacizumab combined with erlotinib treatment of EGFR gene mutations in non-small cell lung cancer, can effectively extend the overall survival time of patients. However, studies have shown that , for different types of gene mutations in patients, the clinical efficacy of treatment was also different. As the sample size of this study is small, we did not analyze patients with different types of gene mutations, suggesting that further study can be carried out for in-depth analysis of chemotherapy efficacy differences among different EGFR types. In summary, compared with patients with EGFR gene non-mutation, in non-small cell lung cancer patients with EGFR gene mutation, bevacizumab combined with erlotinib treatment of non-small cell lung cancer has higher efficiency, better patient tolerance and longer overall survival time. Brahmer J, Reckamp KL, Baas P, Crinò L, Eberhardt WE, Poddubskaya E, Antonia S, Pluzanski A, Vokes EE, Holgado E, Waterhouse D, Ready N, Gainor J, Arén Frontera O, Havel L, Steins M, Garassino MC, Aerts JG, Domine M, Paz-Ares L, Reck M, Baudelet C, Harbison CT, Lestini B, Spigel DR. Nivolumab versus Docetaxel in Advanced Squamous-Cell Non-Small-Cell Lung Cancer. N Engl J Med 2015; 373: 123-135. Cai J, Liu Y, Yin F. Extracting Breathing Signal Using Fourier Transform from Cine Magnetic Resonance Imaging. Cancer Translat Med 2015; 1: 16. Chen YM, Lai CH, Chang HC. The impact of clinical parameters on progression-free survival of non-small cell lung cancerpatients harboring EGFR-mutations receiving first-line EGFR-tyrosine kinase inhibitors. Lung Cancer 2016; 93: 47-54. Narita Y, Matsushima Y, Shiroiwa T, Chiba K, Nakanishi Y, Kurokawa T, Urushihara H5. Cost-effectiveness analysis of EGFR mutation testing and gefitinib as first-line therapy for non-small cell lung cancer. Lung Cancer 2015; 90: 71-77. Janne PA, Ramalingam SS, Yang JCH. Clinical activity of the mutant-selective EGFR inhibitor AZD9291 in patients (pts) with EGFR inhibitor–resistant non-small cell lung cancer (NSCLC). 2014. Lee CK, Brown C, Gralla RJ, Hirsh V, Thongprasert S, Tsai CM, Tan EH, Ho JC, Chu da T, Zaatar A, Osorio Sanchez JA, Vu VV, Au JS, Inoue A, Lee SM, Gebski V, Yang JC. Impact of EGFR inhibitor in non-small cell lung cancer on progression-free and overall survival: a meta-analysis. J Natl Cancer Inst 2013; 105: 595-605. Watanabe S, Minegishi Y, Yoshizawa H, Maemondo M, Inoue A, Sugawara S, Isobe H, Harada M, Ishii Y, Gemma A, Hagiwara K, Kobayashi K. Effectiveness of gefitinib against non-small-cell lung cancer with the uncommon EGFR mutations G719X and L861Q. J Thorac Oncol 2014; 9: 189-194. Yang JC, Sequist LV, Geater SL. Clinical activity of afatinib in patients with advanced non-small-cell lung cancer harbouring uncommon EGFR mutations: a combined post-hoc analysis of LUX-Lung 2, LUX-Lung 3, and LUX-Lung 6. Lancet Oncol 2015; 16: 830-838. Cai J, Turner K, Liang X. Target-Matching Accuracy in Stereotactic Body Radiation Therapy of Lung Cancer: An Investigation Based on Four-Dimensional Digital Human Phantom. Cancer Translat Med 2016; 2: 65. Garon EB, Rizvi NA, Hui R, Leighl N, Balmanoukian AS, Eder JP, Patnaik A, Aggarwal C, Gubens M, Horn L, Carcereny E, Ahn MJ, Felip E, Lee JS, Hellmann MD, Hamid O, Goldman JW, Soria JC, Dolled-Filhart M, Rutledge RZ, Zhang J, Lunceford JK, Rangwala R, Lubiniecki GM, Roach C, Emancipator K, Gandhi L; KEYNOTE-001 Investigators. Pembrolizumab for the treatment of non-small-cell lung cancer. N Engl J Med 2015; 372: 2018-2028. Huang L, Fu L1. Mechanisms of resistance to EGFR tyrosine kinase inhibitors. Acta Pharm Sin B 2015; 5: 390-401. Yeo CD, Park KH, Park CK. Expression of insulin-like growth factor 1 receptor (IGF-1R) predicts poor responses to epidermal growth factor receptor (EGFR) tyrosine kinase inhibitors in non-small cell lung cancer patients harboring activating EGFR mutations. Lung Cancer 2015; 87: 311-317. Garon EB, Ciuleanu TE, Arrieta O. Ramucirumab plus docetaxel versus placebo plus docetaxel for second-line treatment of stage IV non-small-cell lung cancer after disease progression on platinum-based therapy (REVEL): a multicentre, double-blind, randomised phase 3 trial. Lancet 2014; 384: 665-673. Leighl NB, Rekhtman N, Biermann WA. Molecular testing for selection of patients with lung cancer for epidermal growth factor receptor and anaplastic lymphoma kinase tyrosine kinase inhibitors: American Society of Clinical Oncology endorsement of the College of American Pathologists/International Association for the study of lung cancer/association for molecular pathology guideline. J Clin Oncol 2014; 32: 3673-3679. Ohashi K, Maruvka YE, Michor F. Epidermal growth factor receptor tyrosine kinase inhibitor–resistant disease. J Clin Oncol 2013; 31: 1070-1080. Yoshida T, Yoh K, Niho S. RECIST progression patterns during EGFR tyrosine kinase inhibitor treatment of advanced non-small cell lung cancer patients harboring an EGFR mutation. Lung Cancer 2015; 90: 477-483. Li H, Takayama K, Wang S. Addition of bevacizumab enhances antitumor activity of erlotinib against non-small cell lung cancer xenografts depending on VEGF expression. Cancer Chemother Pharmacol 2014; 74: 1297-1305. Ning J, Wu Q, Liu Z. Mapping inhibitor response to the in-frame deletions, insertions and duplications of epidermal growth factor receptor (EGFR) in non-small cell lung cancer. J Recept Signal Transduct Res 2016; 36: 37-44. Welsh JW, Komaki R, Amini A, Munsell MF, Unger W, Allen PK, Chang JY, Wefel JS, McGovern SL, Garland LL, Chen SS, Holt J, Liao Z, Brown P, Sulman E, Heymach JV, Kim ES, Stea B. Phase II trial of erlotinib plus concurrent whole-brain radiation therapy for patients with brain metastases from non-small-cell lung cancer. J Clin Oncol 2013; 31: 895-902. Chen Z, Fillmore CM, Hammerman PS3, Kim CF4, Wong KK5. Non-small-cell lung cancers: a heterogeneous set of diseases. Nat Rev Cancer 2014; 14: 535-546.